From Argentina and Francisco in Guatemala, this box is crafted by young people from the Asociacion ADISA. 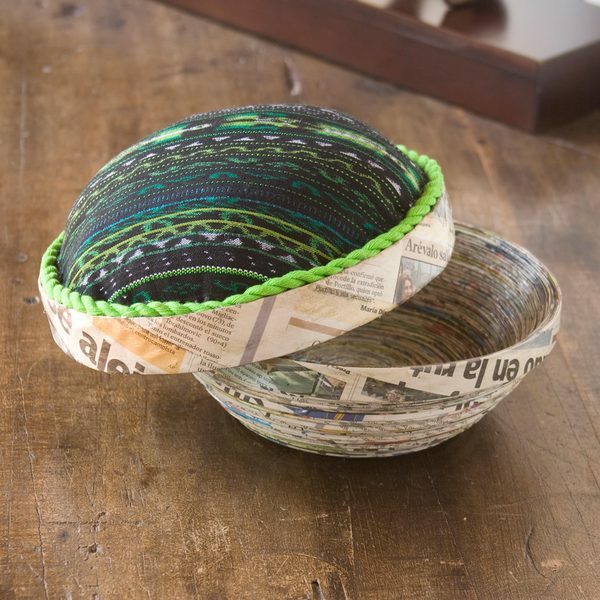 The bowl takes shape from spirals of recycled paper, as the lid features the hand-woven textiles of San Lucas Toliman. Francisco and Argentina's daughter Nyla Eliza was born with hydrocephaly. She passed away when she was 10 years old. They founded Asociacion ADISA in her honor. What first began as a support group for parents and children with special needs, ADISA has now become an association that provides education so that children can join mainstream schools. Youngsters adore making recycled paper crafts so they may eventually have a craft when they are too old to attend ADISA.